A new computer is a popular high school graduation gift, and a great one at that! However, getting all your favorite applications and software isn’t as exciting, and can be a very time-consuming process. Luckily, Patrick Swieskowski and Sascha Kuzins–two awesome people at Secure by Design, Inc–have created a way to streamline that process for us! Click here to visit Ninite, a website with a long list of popular software that you can download in a single bundle. What would you like to download? Check the software you want on your machine–Ninite (which takes suggestions of what apps to include) offers a multitude of selections in categories such as browsers, imaging, media, developer, and documents. This is great if you are (as we hope you are) a devout user of Firefox and Chrome, because your average Windows machine, for instance, comes only with Internet Explorer. How about another free favorite of ours, the imaging app Gimp? Yup! It’s there too. Easy to download the bundle! After you’ve made your selections, download the installer and treat it like a dot exe file–execute it! All the programs you want will quickly download. It’s as easy as that! If you’ve ever spent time on the Internet, you’ve undoubtedly encountered zip files. Zip files (.zip) are typically used as a means to send multiple files from one computer to the next in an easy fashion. However, unless you’re a computer science major, you may have had some trouble understanding how to easily open them. Some people turn to programs like WinZip, for which you have to pay, in order to handle the job. You, however, are a poor but savvy UMW student, and you want a better option! I offer you a free program that is just as easy to use: 7-Zip. It’s an open-source freeware for Windows and Linux that I’ve been using for years. In fact, I’ve been using it for so long that when I went to research this post, I desperately needed to update the program from the 4.65 incarnation I was using to its latest, 9.20. That’s how good 7-Zip is, and how useful. It’s a simple program–1mb in size–that never devalues. 7-zip also features an active forum for support and questions. Give it a try, and make your file transfers much easier–and cheaper! Comments Off on Unzip It ith 7-Zip! Do you have anything to do with math, ever? Have you been assigned projects which require you to make use of some kind of mathematical software, like MAPLE, or MATLAB, or Mathematica? Chances are, if you take anything heavy in statistics or applied math, you have been or will be. Now, you have options. You could pay for a license ($99 for MAPLE, $139 for Mathematica and these are student prices), you could pirate them (risky, banned at UMW and illegal), you could trudge on over to Trinkle in the dark and the snow (winter is coming, after all), or you could go for the free, open-source alternative: Sage. Sage works on Windows, Mac (binaries are coming for Lion, but the Snow Leopard release should work) and Linux (Ubuntu, Fedora or source). It’s a hefty download (1.4 gigs for Windows), but after that you’re using your computer for what computers were built for: all that math stuff. Do you have any account online, ever? Google, Yahoo!, WordPress? (Myspace?) Try it free, online (i.e., no download), here. DO IT NOW. A tool does not make the master, but it certainly make the master’s job easier. That’s why I’m bringing yWriter to the attention of our readers, particularly our creative writers. 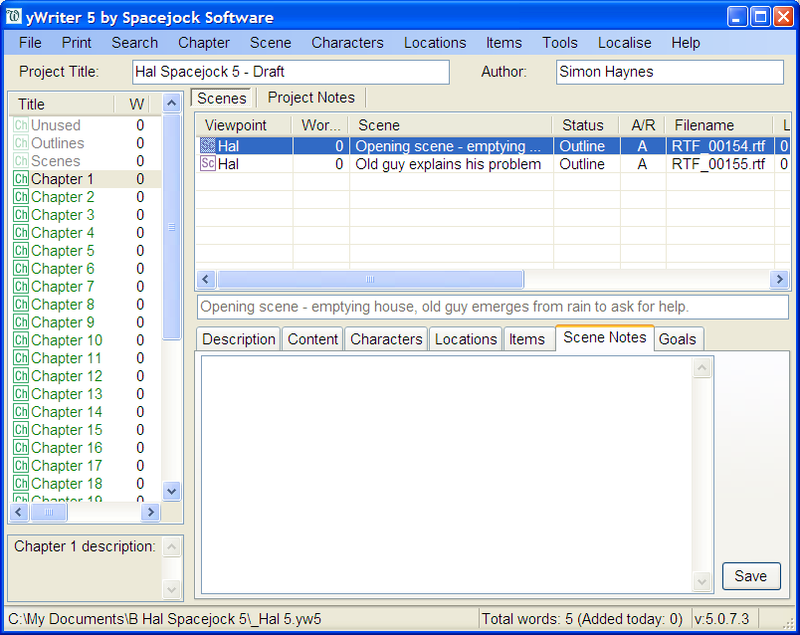 yWriter is a piece of freeware developed by a writer for writers. Simon Haynes (author of the Hal Spacejock series) created yWriter after struggling to write his first novel in an organized and efficient manner. “I really struggled with my first novel because I wrote slabs of text into a big word processor file and I just couldn’t make sense of the whole thing at once. No real overview, no easy jumping from scene to scene, nothing,” he states on his website. As an experienced computer programmer, he possessed the know-how to create a piece of software that would work with him, and then kindly shared it with the world for free (and with regular updates). yWriter’s keynote feature is its usage of “scenes” inside chapter files. As a creative writer myself, I found that thinking about my story in such terms helped me as well, and although I have a plethora of other programs I could write on, I’ve been a satisfied user of yWriter for the past three years. I first discovered it while participating in NaNoWriMo (which is going on now). Give it a try. You might discover that yWriter is the tool that will revolutionize the way your approach and complete your stories. It’s compatible on all system. If you find it useful, consider making a donation of support and thanks. Comments Off on (Wh)Y Write(r)? I feel guilty posting about a game that costs money to purchase (though there is a free version), but the hours you put into playing it will make it feel like you got a deal. Also, this isn’t a typical video game, in that it doesn’t cost $300+ for the console and $60+ for the actual game. If you are reading this post, you can play this game. It’s available in Pocket Edition, playable on your Android, for $6.99 as well as its original format on the PC for $21.99 (Windows, Mac & Linux). If don’t mind missing out on the fancier features, you can always play it for free in your browser! What makes Minecraft great? Well, while the game itself is fun and frankly addictive, the community that has sprung up around the game is fun and impressive. Even the de facto official Wiki is run by volunteers. There are also thriving forums all over the internet full of active members who create their own mods for the game and share them with others. You can get everything from a mini-map to new skins for your world and yourself. However, what I feel makes Minecraft truly fun is its multi-player aspect. There are many open servers available to the public (though care must be taken to avoid griefers and unsuitable mining mates), though I’ve found it far more rewarding to play on a private server with friends. In fact, my favorite place to mine is on a server that a summer class put together.